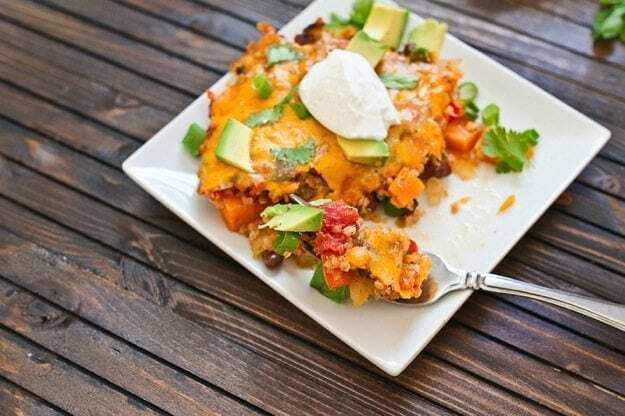 This sweet potato and quinoa fiesta bake is not only packed with veggies and plant-based protein, but is bursting with traditional Mexican flavors that the whole family will love. Vegetarian and gluten-free. Hi there. I hope you’re having an awesome weekend. The weather has been absolutely gorgeous here so we’ve been outside for most of it. And I’m excited because I have quite the recipe to share with you today. It’s vegetarian, packed with protein (18 grams per serving) and gluten-free. I think you’re going to like it. When you think of healthy food, Mexican food isn’t typically the first thing to pop in your head (at least not for me). 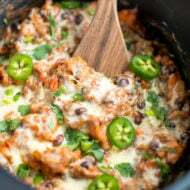 But you can certainly make Mexican dishes that are healthy and the recipe I’m sharing today proves it. 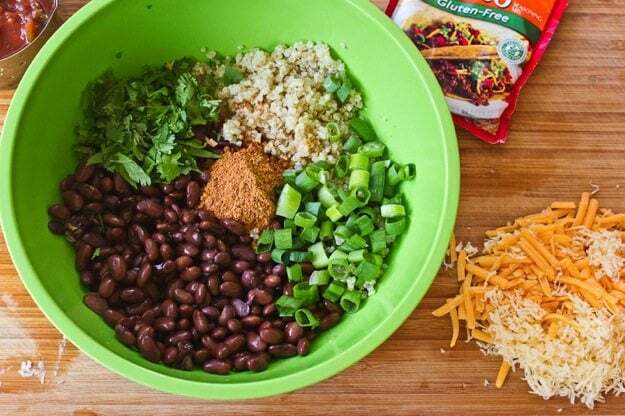 Lots of veggies, some quinoa, beans, a little cheese and you got yourself a delicious and nutritious Mexican feast. I usually only take final product food photos for the blog but while I was chopping up everything for this recipe the cutting board looked so pretty that I thought I should take a photo. Once I had taken a shot of the ingredients, I just rolled with it and ended up taking additional prep photos as well. These beans look like regular black beans but they’re black soybeans. I didn’t know that black soybeans even existed but I’m glad I found these because they have more protein and less carbs than regular black beans. Score! Okay, now on to the prepping of the recipe — start by chopping everything, then add your sweet potato, red pepper and onion to the bottom of a greased 9″x 13″ baking dish. Next, sprinkle a little (about 1 teaspoon) of the taco seasoning on the veggies. I used McCormick’s new gluten-free taco seasoning mix. As I mentioned in the Spicy Chili Black Bean Burgers post, McCormick’s line of gluten-free recipe mixes are certified by the National Foundation for Celiac Awareness. These delicious mixes are also priced the same as regular varieties. It’s real gluten-free food you can feel good about without compromising on flavor! Moving right along. 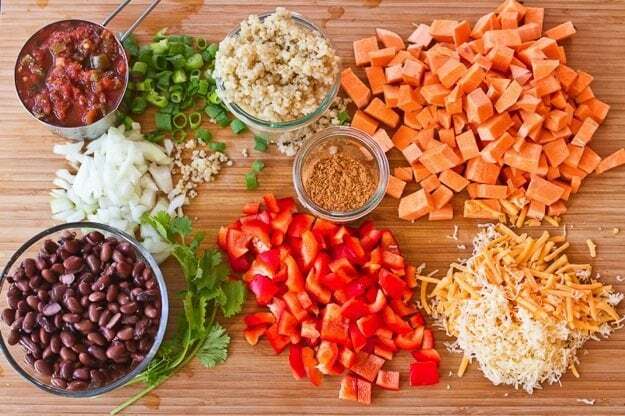 You’ll grab a bowl and combine the cooked quinoa, beans, cilantro, green onion and additional taco seasoning in a bowl and then spread it over the sweet potato and red pepper layer. Next, add a layer of salsa. Top it off with cheese, cover with aluminum foil and bake. It will come out of the oven piping hot with a perfectly gooey layer of cheese. Yum! Isaac and I LOVED this dish. Each bite is full of flavor and texture — a fiesta in your mouth, if you will. All the veggies are cooked to perfection so they taste fresh instead of overcooked and mushy. I used a HOT salsa so our fiesta bake had a bit of heat. That said it wasn’t too hot and the creamy bites of avocado and greek yogurt were the perfect contrast to the spicy bites. If you don’t like spicy things, I recommend using a mild salsa. 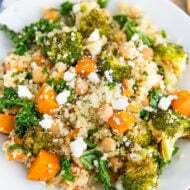 This dish does take a little bit of prep work because you have to chop all the veggies and cook the quinoa. It’s worth it! And if necessary, you can save time by prepping the whole bake ahead of time and then just pop it in the oven right before dinner time. 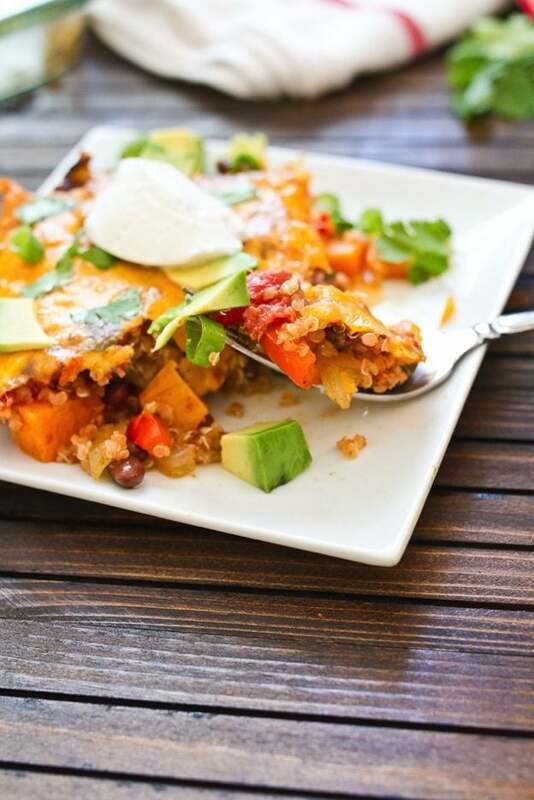 If you make this sweet potato and quinoa fiesta bake, please be sure to leave a comment and star rating below. Your feedback is super helpful for the EBF team and other readers who are thinking about making the recipe. Bring the water and quinoa to boil in a saucepan. Reduce to a simmer, cover and cook for 15 minutes. Remove from heat and let the covered saucepan cool for 4-5 minutes. Remove the lid and fluff with a fork. Set aside. 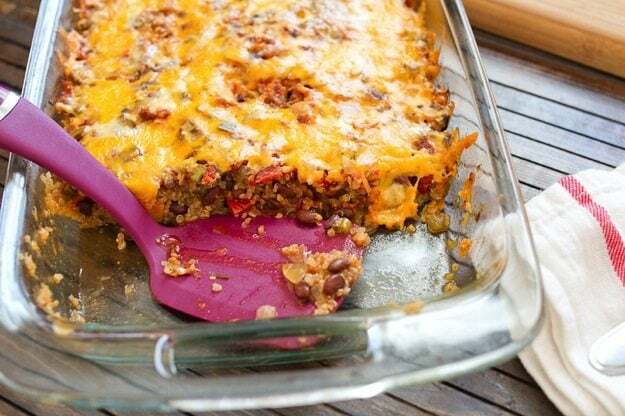 Preheat the oven to 350° F. Grease a 9″x 13″ dish and spread the sweet potato, bell pepper, and onion in the bottom. Sprinkle with 1 teaspoon of the taco seasoning. 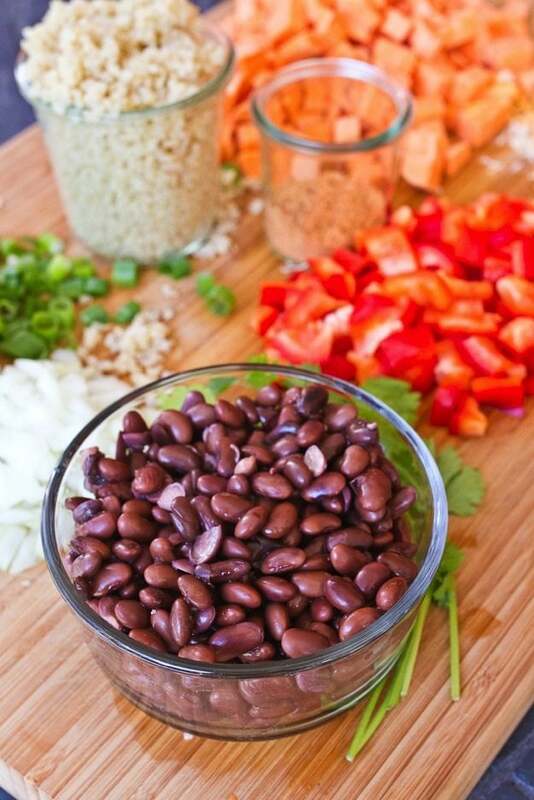 In a bowl combine the beans, cooked quinoa, green onion, cilantro and 1 tablespoon of taco seasoning; mix well. 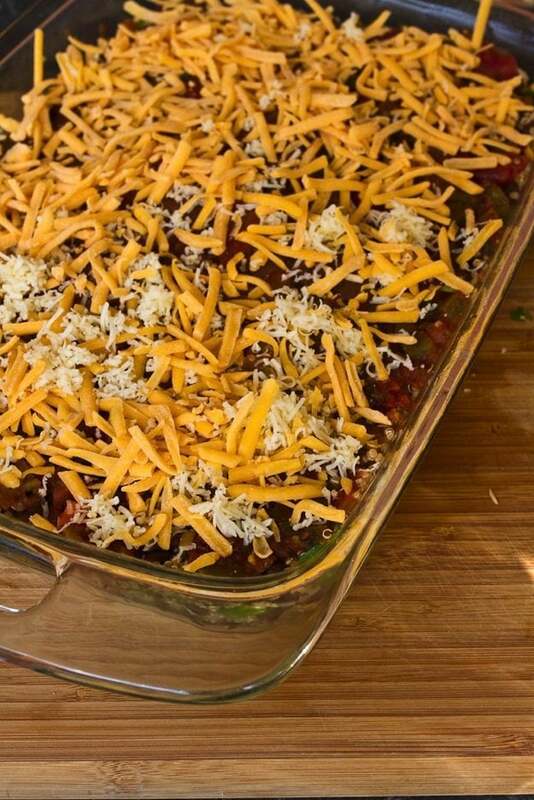 Place the bean and quinoa mixture over the veggies in the baking dish. 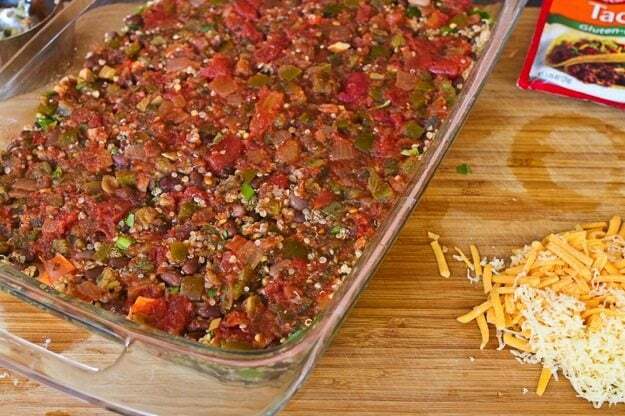 Spread salsa on top of the quinoa mixture. Top with cheese. Cover with aluminum foil and bake for 40 minutes. Removed cover and bake for another 20 minutes or until cheese has melted, the sweet potatoes are cooked and everything is hot throughout. 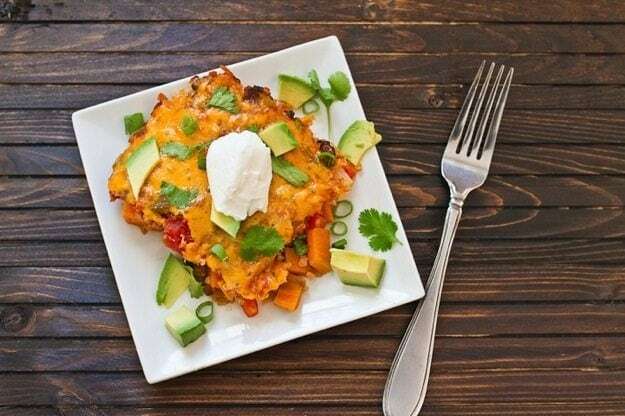 Serve immediately topped with greek yogurt, avocado slices, green onion and cilantro if desired. Disclosure: I was asked to participate in the McCormick Gluten-Free Recipe Mixes Launch as a member of the Healthy Aperture Blogger Network. I received free samples of McCormick Gluten-Free Recipe Mixes from McCormick mentioned in this post and I was compensated for my time. This looks super delicious – fiesta in my mouth! I hardly ever see quinoa in a bake like this! I love the idea! This sounds amazing! What a great idea! I’ll have to be on the lookout for black soybeans. I love regular black beans. 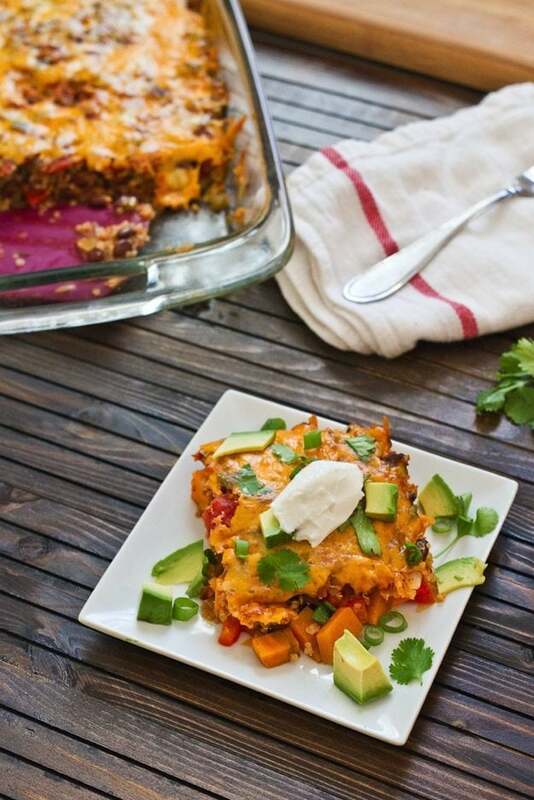 Looks sooo colorful and tasty, and I love anything with sweet potato and quinoa in it. This looks delicious! Very inventive way to use Quinoa. I will have to add it to my list of recipes to try. This looks so good and I would love a crispy cooked egg right on top! I’m always looking for new ways to use quinoa! 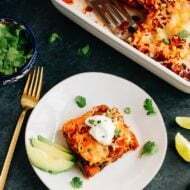 Looks great 🙂 I love topping my Mexican dishes with greek yogurt, too! I am so inspired by this post! I have been on such a Mexican kick lately, and this fits the bill in such a healthy way. Is the sweet potato the right level of cooked at the end? I feel like it might be a little firm… either way, I will fully be trying this recipe soon! Yeah, they cook right up. Just make sure you chop them into small chunks. i made this for dinner monday night and it was so delicious! i featured it as the “recipe of the week” on my run club’s website (www.emmygrace02.wix.com/fcsrunclub). your apple crisp is in the oven as i type this! thanks for proving that healthy and delicious can both be in the same meal! 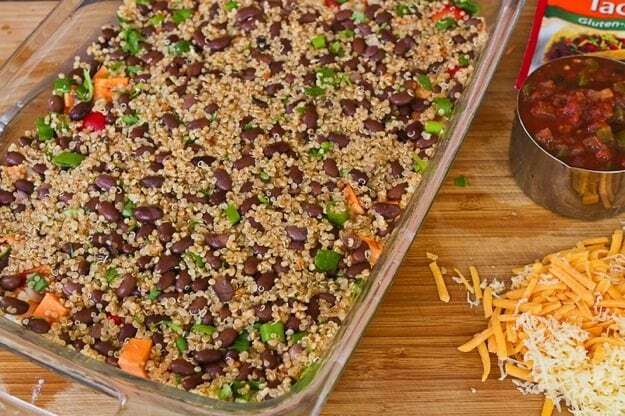 I like any reason to make quinoa into a casserole and this Mexican-inspired version sounds perfect. I made this a couple of nights ago and LOVED it. I had almost everything on-hand but just used homemade taco seasoning, regular black beans and Mexican blend cheese. I found that the veggies on the bottom layer came out still a bit crunchy (but not in a bad way) so maybe I should have left it in the oven a few minutes longer. Next time I may try cooking my quinoa with homemade chicken broth to add even more flavor depth and adding my onion so that it can soften just a bit before going into the casserole dish. Overall I loved this and like that I could get my Mexican fix in a healthy way! That looks super delicious! I can’t wait to make this! Just prepped this for tonight! Thanks, B! 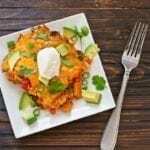 You have been one of my all time favorite recipes through and through for personal eats for my family to preparing dishes to pass at a work setting! Thank you, Brittany!! It means so much to that you continue to provide me success in my weight loss journey and continue in helping me make healthy foods for my family!! Warm Hugs!! Thank you, it just doesn’t seem enough to be said!! We really enjoyed this bake (we’ve made it twice) but I have to say… this bake time/cook temp is off. The first time I thought it was our fault because I forgot to put it in the oven covered… this time around, foil and all, 40 mins at 350… cheese not melted, lukewarm, hard potatoes, for the second time in a row. Upping the heat and sticking back in for another 20 minutes. And hungry 🙁 That note aside, definitely tasty. Thank you so much for the feedback, Jessica! I really appreciate it. I made the recipe again today and you’re definitely right. It should be cooked covered for 40 minutes, then the top removed and cooked another 20 minutes. I’ll update the recipe. Can I make it with rice and add chicken? You can certainly try it, I’m not 100% sure how it will work since I haven’t tried it. I just made this recipe again for the millionth time and have to comment how much I love it! Even my meat loving husband requests this for dinner. Thanks so much! I made this tonight and it was a huge hit! My husband, three year old, nine month old and I all loved it. My three year old kept saying, “Mmmmmm, this is so good!” We will definitely be adding this to our regular rotation of meals. I loved how easily it came together.